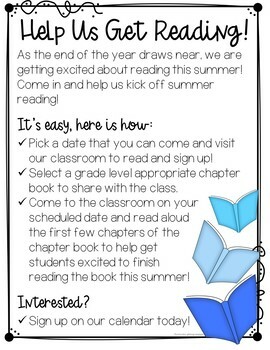 Looking to jump start summer reading in your classroom with a summer reading challenge? 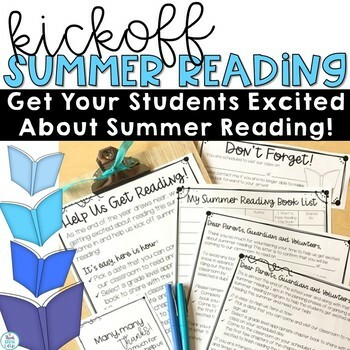 Welcome parents and volunteers into your classroom to help you kick off summer reading and introduce students to new books that they will want to keep reading over the summer! The concept of this program is that volunteers will come to your classroom and give the students a taste of a chapter book by reading the first two chapters aloud, enticing students to finish reading the book over the summer. 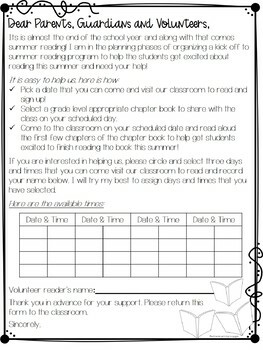 Everything you need is included to plan and organize your own summer reading kick off to engage students as the school year winds down: Parent/volunteer letters, reminder note, book tracker, and more! The letters are forms allow you to add information such as your name and dates. The letters themselves are not editable. Please see the preview for a more detailed look at all this product has to offer. See the preview for more images and a closer look at all this product has to offer. Did you know you can earn TPT Credit towards future purchases by leaving feedback? Go to the “My Purchases” page. Use the provide feedback icon under any item you downloaded. Click it and you will be able to leave a short comment and rating. Each time you provide feedback TPT gives you credits that you may use to lower the cost of any future purchases. 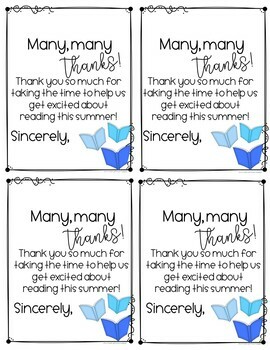 Thank you in advance as your feedback is important to me! Follow me by clicking the green star at the top of my store page for notifications of new products and sales. Remember new products are always 50% off the first 24 hours! Subscribe to my blog for engaging teaching ideas and exclusive freebies!